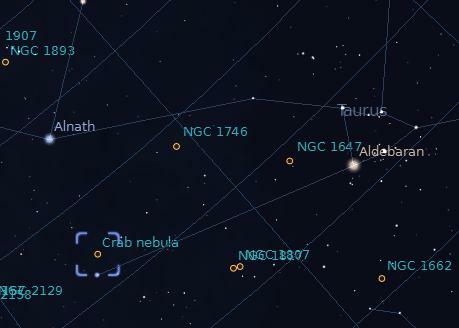 Located in the constellation, “Taurus,” the Crab Nebula was first discovered in 1054 A.D by Chinese and Arab astronomers. Messier made this his first catalogue entry, hence the name Messier 1. 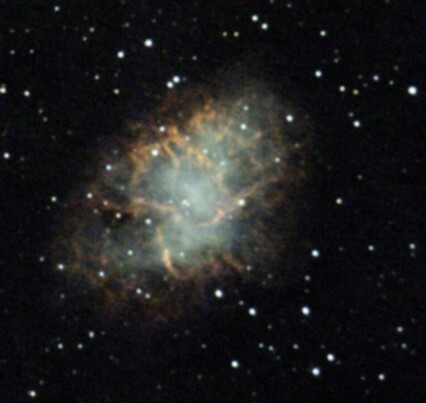 The name “Crab Nebula” comes from it’s resemblance to a crab. The Crab Nebula was formed when a star ran out of fuel and blew itself up in a grand explosion called a supernova. The nebula itself are the bits of that star flying through space at nearly 1500km/s. This rate can be determined by comparing the size of the nebula over a long period of time with very fine measurements. At the center of the nebula lay a very dense “dead” star called a neutron star. This neutron star is spinning around and produces flashes of x-rays. These flashes lead to the appearance of a regular “pulsing”, and so these neutron stars are often called pulsars. 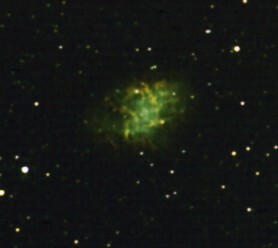 The crab nebula is a very popular amateur object, although imaging to bring out filaments is very difficult with plain light frames. This object is a prime target for any of the three most popular narrowband filters, Ha, OIII, and SII. Unfortunately, I don’t have any of them, so my broadband Orion Skyglow will have to do. And even though it’s not bursting with filaments, it does enhance overall contrast. This image was captured with the Celestron CPC 1100 at full f/10, using a Celestron HD Pro Wedge autoguided with the Orion ST80 and SSAG. Unfortunately I had to toss about half of the exposures due to wind-related issues, but I salvaged a solid 9x 5 minute exposures. At the full f/10 with no reducer/flattener, the final image turned out rather pleasing. It was captured with MaximDL and processed in Nebulosity. For comparison, I captured some data back in November with the Televue NP101is — but only about 30 minutes worth and realized that a bigger scope would probably help me pull some detail out. The right side of the nebula is substantially more diffuse and was a real challenge to bring out any detail without blowing out the rest of the image. Again, this is where those narrowband filters would really help enhance the contrast and make it a lot easier. Surely someone has some good tips out there for dealing with this problem – what have you found? This entry was posted by admin on January 23, 2011 at 8:16 pm, and is filed under Nebulas. Follow any responses to this post through RSS 2.0.You can skip to the end and leave a response. Pinging is currently not allowed.